When it comes to fashion magazines I think it’s safe to say that you will have to pry Vogue from my cold dead hands, but lately my research has led me to a number of smart fashion blogs that are much more than a narcissist’s selfies. Bloggers are the place to go for practical ideas and tips on how to interpret the runway inspirations to real life. Lately I’ve been reading That’s Not My Age, a style blog by British fashion writer Alyson Walsh aimed at readers who are, like her, over 30. In some cases, well over 30. She maintains something most of us believe, despite what the fashion mags peddle — style has no age. She has a witty sense of humour along with a fine sense of styling. And she offers tips on how grown-up women can stay on trend without looking like mutton-dressed-as-lamb. She just did a piece on Helen Mirren, 69, being hired as the new face of L’Oreal — and how great is that? I love those shots of Mirren in a sleek, black pantsuit. But you know me, I’d want to add a necklace. 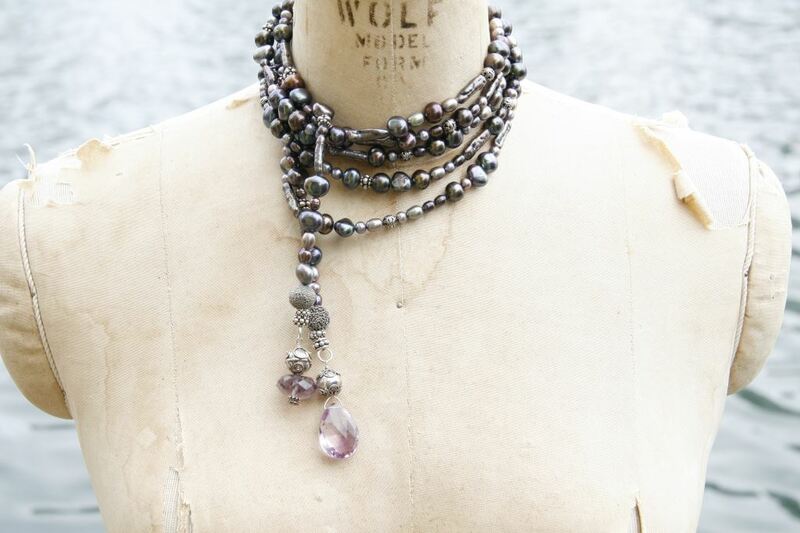 Freshwater pearls in rich purple hues mixed with sterling silver beads and punctuated with large lilac amethysts.